Natural transmission of cytomegalovirus (CMV) has been difficult to observe. However, recent work using the mouse model of murine (M)CMV demonstrated that MCMV initially infects the nasal mucosa after transmission from mothers to pups. We found that intranasal (i.n.) inoculation of C57BL/6J mice resulted in reliable recovery of replicating virus from the nasal mucosa as assessed by plaque assay. After i.n. inoculation, CD8+ T-cell priming occurred in the mandibular, deep-cervical, and mediastinal lymph nodes within 3 days of infection. Although i.n. 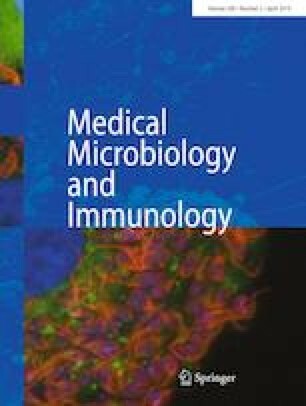 infection induced “memory inflation” of T cells specific for the M38316–323 epitope, there were no detectable CD8+ T-cell responses against the late-appearing IE3416–423 epitope, which contrasts with intraperitoneal (i.p.) infection. MCMV-specific T cells migrated into the nasal mucosa where they developed a tissue-resident memory (TRM) phenotype and this could occur independently of local virus infection or antigen. Strikingly however, virus replication was poorly controlled in the nasal mucosa and MCMV was detectable by plaque assay for at least 4 months after primary infection, making the nasal mucosa a second site for MCMV persistence. Unlike in the salivary glands, the persistence of MCMV in the nasal mucosa was not modulated by IL-10. Taken together, our data characterize the development of local and systemic T-cell responses after intranasal infection by MCMV and define the nasal mucosa, a natural site of viral entry, as a novel site of viral persistence. This article is part of the Special Issue on Immunological Imprinting during Chronic Viral Infection. The online version of this article ( https://doi.org/10.1007/s00430-019-00589-7) contains supplementary material, which is available to authorized users. This work was supported by Grant AI106810 awarded to C.M.S.